This Grecian Square quilt block pattern is a nine patch design that's perfect for beginning quilters. The quilt block is assembled with four quick pieced half square triangle units, four strip pieced segments and one center square. Grecian Square looks completely different when you alter the position of color and color value. In the block on the left, above, the light rectangular patches, red center, and orange triangles pop into view first. The patches in those positions are more subdued in the block on the right. Your quilt can be made up of identical or very similar quilt blocks, but blocks that are sewn with a wide variety of colors will make a scrap quilt. When you're finished, the block will be 9" x 9." Page 3 illustrates one example of a Grecian Square quilt, with large, block-sized quarter square triangle units used as alternate quilt blocks. The triangles in the quarter squares add an additional design element to the layout. Fabric suggestions refer to the quilt block on the left. The red block center and red triangles around the block corners make those areas of the Grecian Square pop out a bit. A soft sherbet orange is placed next to the red — its warmth helps that side of the units stand out in the design. Other fabric colors are neutral. You can change the appearance of the block by flipping the triangle units around and allowing the red triangles to link to the block's center. Or change it even more dramatically by going scrappy or opting for an entirely different set of colors. (1) 3-1/2" x 3-1/2" square for block center. To sew rectangular units together piece by piece, cut (4) 2" x 3-1/2" brown strips and (4) 2" x 3-1/2" cream print strips instead of cutting the longer strips listed above. Pair a 3-7/8" red square with a sherbet orange square of the same size. Use my easy, quick piecing method to create two half square triangle units from the pair. When complete, each unit should measure 3-1/2" x 3-1/2". Repeat to assemble two more half square triangle units from the remaining pair of 3-7/8" red and sherbet orange squares. Sew a 2" x 14-1/2" brown strip lengthwise to the cream print strip of the same size. Press to set the seam. Press seam allowance towards the brown strip. Each strip should be 1-3/4" wide along its entire length. Square up one end of the strip set you just created and then cut four 3-1/2" long segments from it. Each segment should measure 3-1/2" x 3-1/2". If using the optional method, sew each 2" x 3-1/2" brown rectangle to a cream print rectangle and press. Arrange all components into three rows as shown, with the plain red square at the center of the middle row. Sew components in each row together. Press seam allowances in adjoining rows in opposite directions. Sew the rows together, matching seams carefully. The Grecian Square quilt block should measure 9-1/2" x 9-1/2". 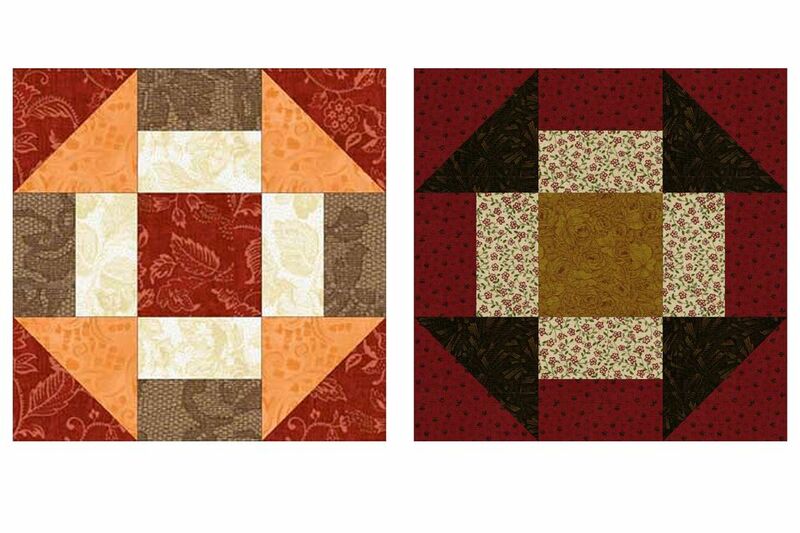 In this layout example, Grecian Square quilt blocks are alternated with large quarter square triangle units. Two sides of the quarter square units are the same red used in block corners, and the other two sides are brown. The same brown replaces the sherbet orange in half square triangle units. Rectangular segments are a different color, too. The "arrows" formed by placing large red triangles adjacent to the smaller triangles in block corners can be aimed upwards by flipping the quarter square units around. To quick piece quarter square triangle units this size, use two contrasting 10-1/4" x 10-1/4" squares and sew them together just as you did to create the small half square triangle units. When cut apart, use the parents you just made to assemble quarter square triangle units (instructions). To determine how much yardage you need, use my yardage calculation instructions.